Service Provider of a wide range of services which include cold cutting and pipe beveling services, flange facing services, line boring machine and controlled bolting services. ABS provides cold cutting and pipe beveling services in environments where hot cutting is not possible due to fire safety. Our Portable Machining Systems, powered pneumatically or hydraulically, simultaneously cut and bevel pipes leading to minimum material wastage. The result being, safe preparation of pipe ends for welding to ensure consistency and quality including straight cut, bevels, compound bevels, J-bevels, compound J bevels and all custom weld preps. The split frame design ensures an easy fit on existing piping systems. We strive to achieve your economic goals and improve the productivity and accuracy of your pipe machining projects. We also offer annual rate contracts to decrease the probability of unscheduled shutdowns by offering ready-to-deploy manpower. 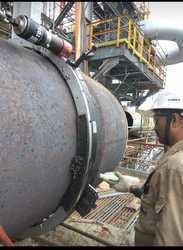 ABS undertakes an array of on-site bolting services ranging from simple bolting of a single flange joint, to major construction, and maintenance of bolted joints of critical applications at shutdown. When it comes to joint integrity, ABS utilizes the highest-standard bolt torqueing and bolt tensioning technology. Looking for Specialized Services ?